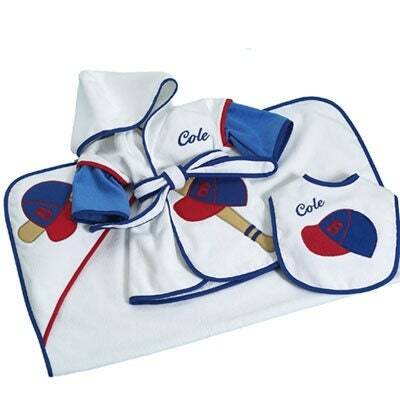 What new parent wouldn't love to receive this beautiful 3-piece set for their new baby boy, especially if mommy and daddy love baseball. From the richness of the terry fabric, to the attractiveness of the styling, this baby gift says quality in every way. The coordinated terry fabric set includes Premium Hooded Cover-Up with contrasting sleeves (size 18 mos. ), a 30" x 36" hooded towel, and a full sized bib. All three items feature a large baseball applique/embroidery. The set is packaged in a white gift box with contrasting ribbon to match the look.